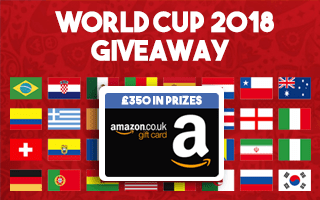 World Cup 2018 Sweepstake - £350+ in prizes! The World Cup kicks off on the 14th June, and here at Team Profit we thought we'd have a bit of fun and organise a sweepstake for our members. It's completely free to enter and there's plenty of prizes to be given away! The best thing about it is that there's prizes for both winners and losers! It's open to the first 320 people who join and entries close at 12pm on June 13th so get involved quick! There are 32 teams in the tournament, so once you enter you will randomly be assigned a team. There will be 10 people per team and if a prize is won, all 10 of you will get the prize. There's 30 prizes in total totalling over £350! Sweepstakes are fun however if you've drawn a team like Panama then the excitement is short lived. Here at Team Profit we wanted to make it a little more interesting, so have added prizes for both the winners and losers! Check out what you can win below! If your team wins the World Cup you will receive this prize! If your team was the first team to go out on penalties then you will receive this prize. If more than one team in the same round goes out on penalties, it will be the first team according to the date & time that will win this prize! If your team was the worst performing team in the cup then you will receive this prize. This is determined by the team with the lowest points, and then by their goal difference. E.g. If two teams both lost all 3 group games, they'll have 0 points. If one team has -5 goal difference and the other -4 goal difference, then the -5 goal difference team will win this prize! - A Facebook account in our Team Profit Facebook group. (If you're having trouble getting in the group then feel free to get in touch). Simply click the banner at the top of this page and fill out your details to entered. Alternatively you can enter by clicking here.